1. Whisk the whole eggs and yolk in a jug with the chosen spice mix. Heat an omelette pan over a medium heat. 2. Pour in the egg mixture and tilt the pan to get an even spread. Cook until just set on top (you can flip it half-way through if you’re feeling confident). Set aside. 3. Wipe the pan and add a small amount of olive oil. Stir-fry the broccoli for 2-3 minutes before adding the prawns. Add a tablespoon of your chosen sauce (if using) and heat through for a minute. 4. Tip the prawn/broccoli mix into the centre of the omelette and wrap up to enclose. Serve alone or with a green side salad. Garnish with chilli flakes if liked. High in protein, but low in calories, prawns are a good source of magnesium, which is central in bone development, as well as muscle function and nerve functioning. Not to mention the brilliant broccoli benefits, which we’ve highlighted below, in our featured ingredient section. 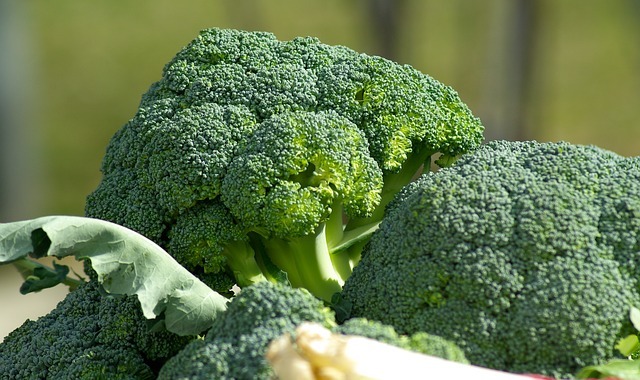 Packed with phytochemicals and antioxidants, the brilliant broccoli benefits digestion, while also boosting the immune system and the cardiovascular system. It also has anti-inflammatory properties, and is thought to possibly have cancer-preventing properties.